Terroir: The grapes used in the production of this wine are provided by the finest vineyards at Mango, Neive and Alba. The vines are grown with Guyot (VSP trellised) system on hills with favorable slopes and soils that are prevalently calcareous-clayey. Vinification: The grapes are hand harvested and transported to the cellar during the day, so as to arrive perfectly intact. We proceed with a soft press, delicate, with consequent cooling of the must to prevent fermentation. It is then placed in cold storage at 28° F. until the next fermentation, which takes place in large pressure vessels, so that the carbon dioxide remains partially dissolved in the wine. When 5 degrees of alcohol have been developed, fermentation is stopped by refrigeration, in order to leave about 140 grams of sugar per liter. 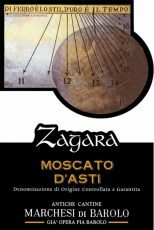 Moscato d’Asti Zagara is then immediately bottled, with the technique sterile cold bottling to preserve the fragrance and freshness. Straw-yellow in color with golden reflections, this Moscato has intense aromas of orange blossoms (Zagarà in piedmontese dialect). On the palate, a soft, yet rich perlage gives way to more orange blossom and peach notes with a sweetness balanced by refreshing acidity and a long, yet delicate finish. This sweet and aromatic wine is delicious paired with custard and fruit based desserts or on its own. Chopped herb, white spring flower and yellow stone fruit aromas jump out of the glass. The rich, frothy palate offers candied nectarine zest, apricot and lemon drop set against a soft, foaming perlage.